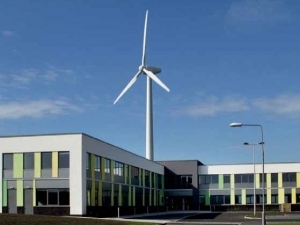 The building is connected to the Green Energy supply which draws renewable power from its onsite 750kW Wind Turbine. The facility is served by a ground source heat pump connected to 14 bore holes with the building core served from an innovative state-of-the-art hydrogen boiler. Surplus electricity from the Wind Turbine is used to electrolyse water, creating hydrogen which is then stored to support peak demand requirements.